When modern Europeans arrived in North America, an estimated 50 million bison inhabited the continent. After the great slaughter of American bison during the 1800s, the number of bison remaining alive in North America declined to as low as 541. During that period, a handful of ranchers gathered remnants of the existing herds to save the species from extinction. By the 1830s the Comanche and their allies on the southern plains were killing about 280,000 bison a year, which was near the limit of sustainability for that region. Firearms and horses, along with a growing export market for buffalo robes and bison meat had resulted in larger and larger numbers of bison killed each year. The railroad industry also wanted bison herds culled or eliminated. Herds of bison on tracks could damage locomotives when the trains failed to stop in time. Herds often took shelter in the artificial cuts formed by the grade of the track winding though hills and mountains in harsh winter conditions. As a result, bison herds could delay a train for days, or potentially wrecking the engine. The railroads would hire marksmen to ride their trains and just shoot the bison as the train went by. Bison bones were used in refining sugar, and in making fertilizer and fine bone china. The US Army sanctioned and actively endorsed the wholesale slaughter of bison herds. The federal government promoted bison hunting for various reasons, to allow ranchers to range their cattle without competition from other bovines, and to weaken the North American Indian population. The US government even paid a bounty for each bison skull recovered. Military commanders were ordering their troops to kill bison — not for food, but to deny Native Americans their own source of food. One general believed that bison hunters “did more to defeat the Indian nations in a few years than soldiers did in 50 years”. By 1880, the slaughter was almost over. Where millions of bison once roamed, only a few thousand animals remained. Thanks in large part to conservation efforts undertaken by volunteers and later US government, the American bison was saved from total extinction. Approximately 500,000 bison currently exist on non-public lands and approximately 30,000 on public lands which includes environmental and government preserves. According to the IUCN, approximately 15,000 bison are considered wild, free-range bison not primarily confined by fencing. In 1884 there was around 325 wild bison left in the United States – including 25 in Yellowstone. Before the Europeans arrived in the New World, there was more than 50 million bison in North America. How many bison skulls might be in the photo? Hard to tell without being able to see the whole pile. Some rough calculations based on skulls volume and the dimensions of the pile calculate 180,000 skulls on that pile. Buffalo bill in other time, kill thousand of bisons, when bisons are running, the make a vibrations in the earth like a massage to the earth, in this way, they activate the chakras from the earth. african elephant are being slaughtered for their tusks and left to rot TODAY. they are going extinct because of it. 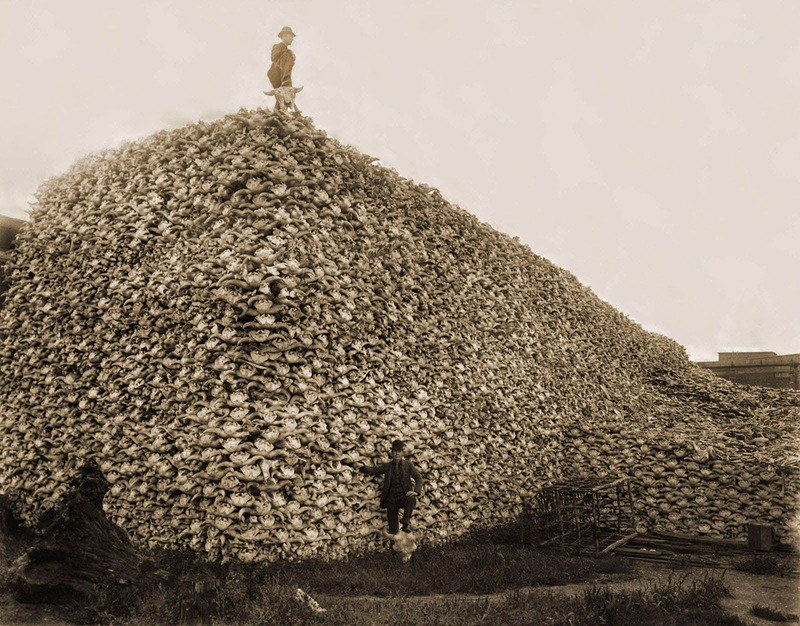 if you grouped up the skulls of the elephants we could have piles rivaling the Bison skull piles of 135 years ago. Poachers leave them to rot paying hunters hunt with a professional guide licensed by the government. They butcher them down to the bare bones for food. Even some bones are used. In many cases in villages where they have trouble with a certain elephant local villagers will go with the hunter and show them which one to shoot. Helping to save there crops that he was destroying. A picture of hundreds of thousands of of American bulls "Buffalo" in the eighteenth century, the white people kill thos bulls in largest quantity not for food but to deprive the Indians of the source of their food and force them to emigrate in an attempt to eliminate the Native American population, singling out the land from the colonialists ... yet only a few thousands of bulls remains after it had been deployed in millions of US territory.. Anything else is just a lie .. Exactly. I see that very, very important historical fact has been left out of every instance of this photo showing up online. The Whites intentionally slaughtered the bison to help kill the Native Tribes so they would have less resistance to the stealing of land. The United States government had encouraged people to kill buffalo, and it was a way to control the Indians. If they could take away their food source, then they could tell them where to live and move ’em around. Anything you hear is a white lie!!!! Totally unfair, Indians have rights too! The most dangerous animal on earth - the white people. To kill is in their DNA. It's in the 'Human' DNA to kill, not white people. Don't be a racist. We are on par with mice, or a virus, we grow till there is no room left, and then we eat each other. This is difficult to estimate. I got 100,000 skulls. Counting skulls, the large stack is 33 skulls high and they appear to be stacked upside down. 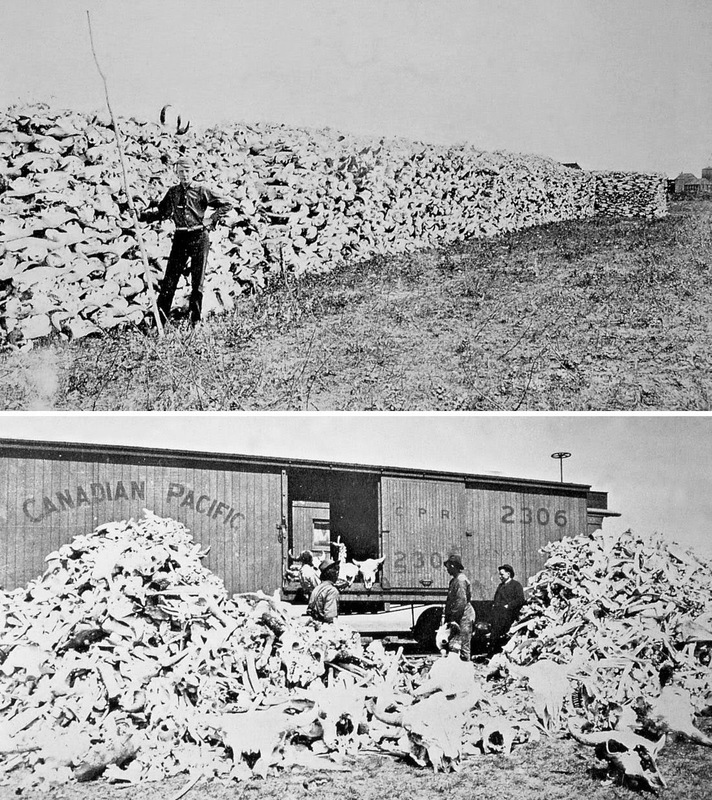 Judging from the photo of a lone man leaning against a wall of skulls, the human body is 8 skulls tall; using this estimate, and the two men at the large stack, this is 32 skulls high. The front is roughly a square and the side is roughly a 5 by 1 rectangle. Skulls appear stacked 7 high for every 5 wide. The smaller pile is less evenly stacked but the front of its base seems to be 12 high and 18 wide, in skull. If we assume the back corner is even with the larger stack, it is 70 skulls long. The uneven top of the pile is less than half the size of the bottom: 70 x 12 x 18 x 150% = 23,000. It is difficult to judge, but this would be an upper estimate. Definitely more than 30,000 and less than 180,000. Also they used trains, the trains moved slowly during the time they massacred all the bison they can find.